It's Week 6 of our Calling it Home One Room Challenge and I am finished! Our original pre-extension deadline was this week so I had already ordered everything to arrive in time for a photo shoot this week - including flowers. I kept them in my fridge for a while but they weren't going to last so I've been taking pictures over the past few days for my final reveal next week! As a result, this worry-free weekend will be spent with my munchkins doing whatever they would like to do. If this is your first time here, take a quick look at Week 1 / Week 2 / Week 3 / Week 4 / Week 5 where I've shared the transformation of my very own principle bedroom/office. Week 6 was a week full of DIYs and redesigned finds including two Habitat for Humanity Restore dressers, two Value Village vintage lamps and a Kijiji secretary desk. 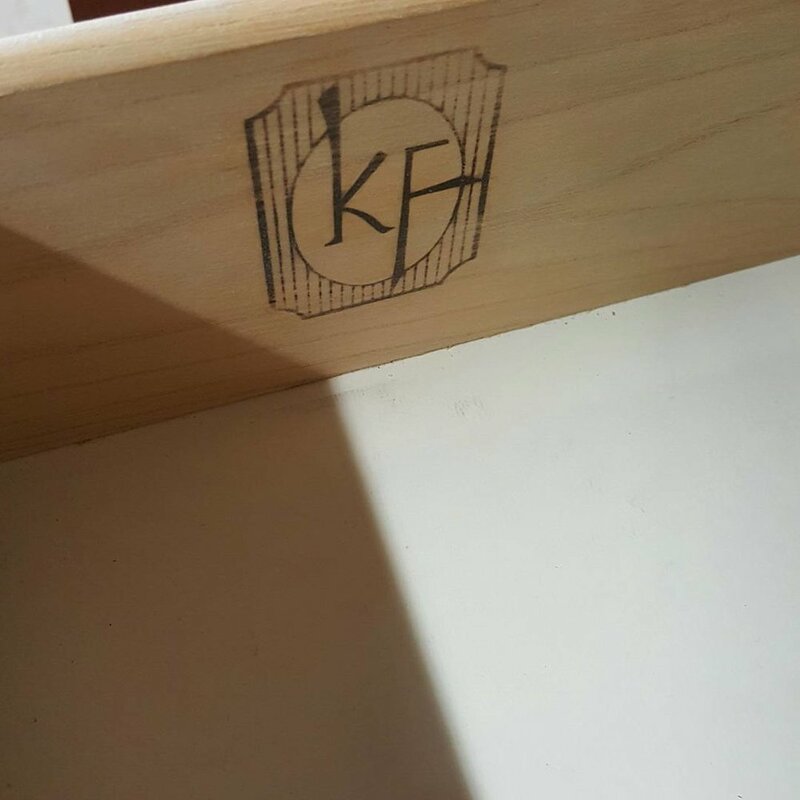 If you follow me on Instagram you may remember me posting two Kling Factories dressers I found at the Orillia Habitat for Humanity Restore in the spring for only $70 for the pair! I knew they would be perfect as bedside tables in my room eventually. My inspiration for the dresser makeover was this beautiful Madeline nightstand by McGee & Co. I loved the lacquer, brass bamboo hardware and transitional design. After another trip to our Orillia Home Hardware for their Cabinet & Furniture paint I went to work sanding priming and painting just like I did with Lily's dresser and Matthew's nightstands. I used Benjamin Moore's "Cloud White" in a high gloss that would complement the wall colour in my room but give the dressers a lacquer look. I searched high and low for brass bamboo hardware and I found the perfect ones through Rejuvenation. They shipped really fast and are the perfect addition to these beautiful redesigned finds. I searched everywhere for something with a similar shape, colour and brass base but once you have something in your head, nothing else will do. My sister, friends and I looked in every Winners and Homesense store, thrift stores and on Kijiji with no luck. I wasn't willing to settle and waste money on mass produced lamps that I didn't love so I took a look at some of the finds I already had. This summer I found some white and gold lamps with a teak wood on them. They had a mid-century look from the wood and I didn't think they were really my style but I bought them thinking I may use them in a design for someone else one day. They were at steal at under $16 for the pair! I gave them a good cleaning, replaced the harps to shorter brass ones and installed some white lamps shades that I already had. With the new harps and shades the wood was less noticeable and I didn't mind them as much. When I put them in the space on the new bedside tables they looked great! In Week 5 I showed some of my "perfectly imperfect pieces" including this deco secretary desk I found on Kijiji that my Dad bought me for my birthday. kijiji deco secretary desk "before"
I removed the decorative panel, kept the wood on the shelves and sides and installed the Hornbeam wallpaper using painter's tape as a temporary solution. 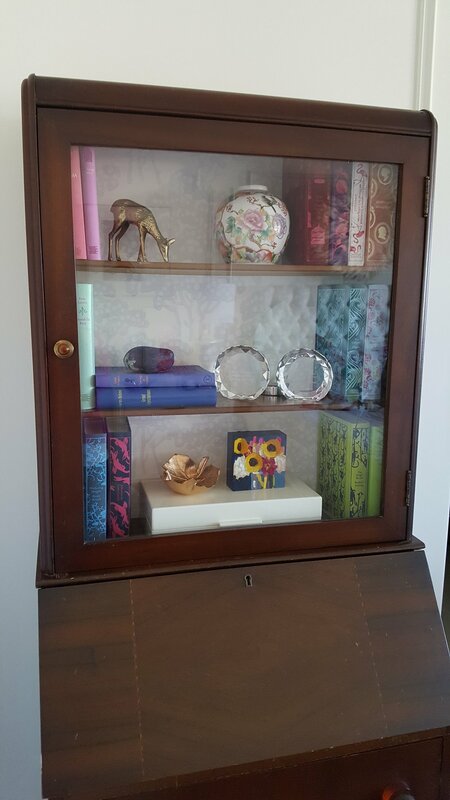 After a little styling using books, a few vintage pieces, DIYs and a pretty mini painting from Melanie Morris Art it looks as good as new! That little gold leaf bowl is a recent DIY that I made with my children so I promise to post that this week. As for the rest, I'm excited to share all of the details of my room next week for the final reveal!